In 2004, Michael Burawoy, speaking as president of the American Sociological Association, generated far-reaching controversy when he issued an ambitious and impassioned call for a "public sociology." 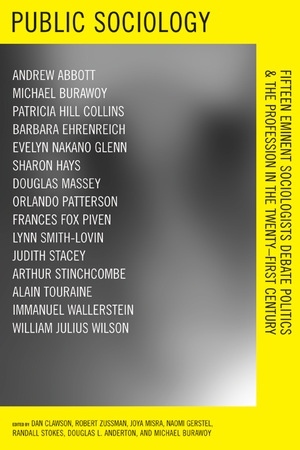 Burawoy argued that sociology should speak beyond the university, engaging with social movements and deepening an understanding of the historical and social context in which they exist. In this volume, renowned sociologists come together to debate the perils and the potentials of Burawoy's challenge. Dan Clawson, Robert Zussman, Joya Misra, Naomi Gerstel, Randall Stokes, and Douglas L. Anderton teach in the Department of Sociology at the University of Massachusetts. Michael Burawoy, former president of the American Sociological Association, is Professor of Sociology at the University of California, Berkeley.